I was reminded of the cellar when my nephew Oaky wrote that all the sprawling Knight clan is invited to a Halloween/Fall Festival at dear old Stone Gables. Most of his descriptions of the expected fun were very inviting, such as an apple bobbing, tramping spooky trails, making up ghost stories, eating hotdogs and even green goo! I can just picture some of the very imaginative costumes these youngsters are going to wear, and how the big ones will watch out for the little ones! But when Oaky mentioned that some brave souls might visit the “dungeon,” my mind raced back through the years to a time when I investigated Stone Gables’ cellar on a dare! Daddy bought several bushels of peaches at a time during the summer and kept them cool in the cellar, bringing them out one bushel at a time for us to peel and cut for Mamma’s canning. In the winter he stored wood just inside the cellar door. There was space beyond our normal use for a furnace to be installed–sometime–a dark, dank place where any imaginable hideous Thing might dwell. There was, of course, no electric light, as at that time, we had no electricity anywhere in the house. The cellar was the epitome of darkness. I don’t remember being required by my parents to descend into the cellar, but peer pressure, particularly sibling pressure, did send me there, on a dare. And of course I had to go alone. I could smell the muskiness when I left the last concrete step behind. When I looked back up the steps, daylight shone through a crack between double doors which my brothers had chosen to close. But as I proceeded to fulfill the entire challenge, turning a corner away from that distant light, suddenly there was blackness that was palpable. It seemed to enter my mouth, my nostrils, my brain, and swallow me. My eyes stretched in panic but there was no light anywhere. A giggle far away reminded me I had to take ten more steps. I had to let go of the rough edge of the cellar stairwell and move forward not knowing what my foot might encounter. I squeezed my eyes shut to pretend the darkness wasn’t there. Shuddering as I held my hands before me, I stepped forward. As I progressed, one cautious step at a time, my greatest dread was to step on something alive or to plaster my face into a spider’s web with the spider still in it. Finally, reaching the tenth step, I opened my eyes. And lo! There was light from a small grill set high in an outer wall. Of course I didn’t study it for long. Because at that point my challenge was finished and I dashed back to the steps and up to the freedom of full light. Looking back on it, I can laugh at my fear. But, at the same time, I can almost feel the cold sweat popping out on my face. And then the pride that I had endured, that my brothers were duly impressed by my bravery. I hope the children have a wonderful time, that many of them will be able really to grasp a slippery apple in their mouths, that they can experience the fun of games, competition, and even some well-regulated fear. I’m so glad that our family–aunts, uncles, cousins, second-cousins, and cousins-one-degree-removed, are taking time to have fun together. What a treasure of memories they are making! Happy October, Everyone! Take time for laughter, take time for a little drama, take time for fun and festivities! And, hey! 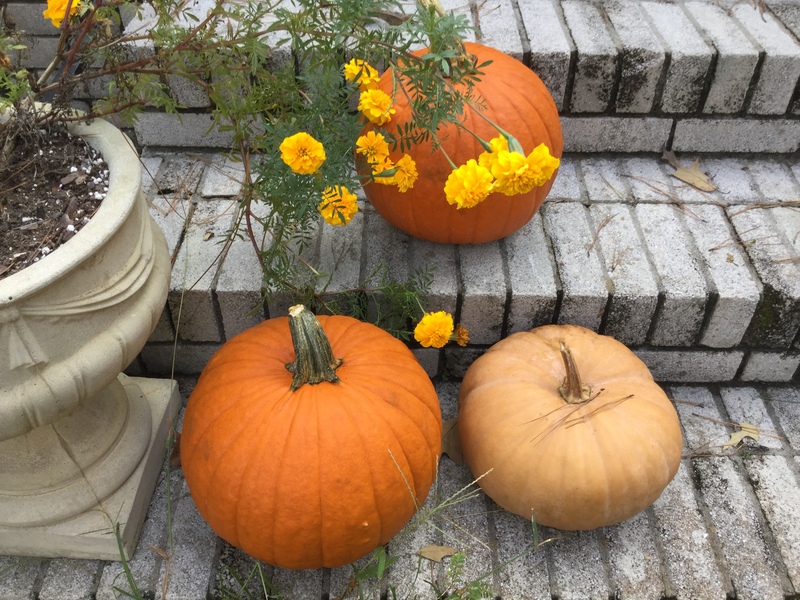 Put a few pumpkins out for cheer. It’s that time of year!